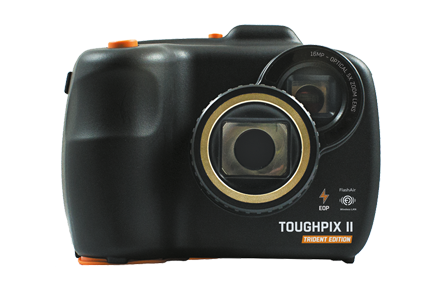 The ToughPIX II TRIDENT EDITION Explosion Proof Digital Camera is designed and certified with the professional inspector in mind. You need a digital camera that’s tough, because that’s the world you work in. You need a digital camera that will shake off the trials of working in a hazardous location and still keep functioning. You need a digital camera that is certified to be safe to use. You need a digital camera that is Tough, Reliable and Certified, you need ToughPIX II TRIDENT EDITION explosion proof compact digital SLR. The ToughPIX II TRIDENT EDITION is ATEX certified Ex d IIB+H2 T6 Gb / II2G Gb T6, for use in hazardous areas ensures it can go safely where most cameras and phones cannot. With its high intensity on board strobe flash, ToughPIX II TRIDENT EDITION lights up the darkest areas making high quality digital imagery easier and clearer than ever. Coupled with 5x optical zoom, 4x digital zoom, anti-shake technology and additional close-up macro lenses, ToughPIX II TRIDENT EDITION gives you the flexibility you need to do your job, any job and get the results you need.